Towards the end of 2016, with a stellar suggestion from my momma, I decided to add Fiber One to my diet on a regular basis. I’ve eaten Fiber One in the past and for no particular reason, got away from it. Its been about 3 months since I’ve been eating Fiber One regularly – anywhere from 3-5x a week – and I can totally tell a difference in my digestion. You’ll find that my plate is typically full of greens, colorful veggies & some type of lean protein, and while I do eat my share of complex carbs – oatmeal, sweet potatoes, quinoa, brown rice, apples, a high fiber cereal such as Fiber One – getting enough fiber in my diet is always a top priority for me in order to keep my digestive system in check. With that being said, another thing Mom has been really into that I’d like to share with you all, the F-Factor Diet. 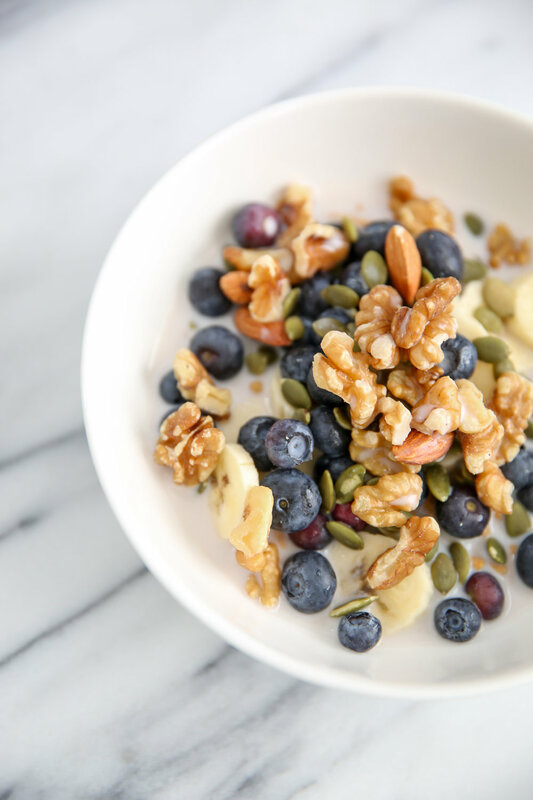 The “F” in F-Factor stands for Fiber. I don’t know about you guys, but, I think fiber is pretty fabulous! 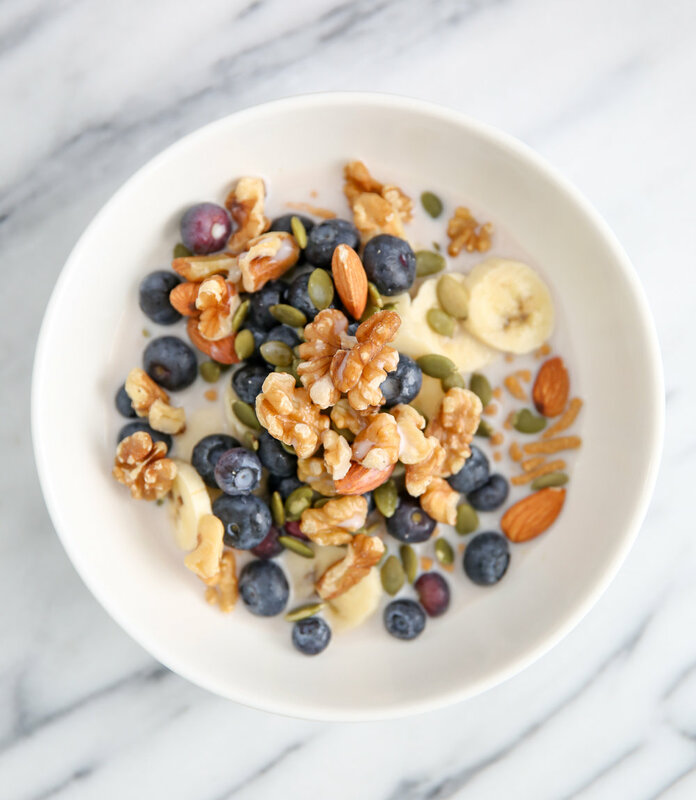 A diet high in fiber is the secret to a healthy digestive system and ultimately, that flat tummy we all desire + fiber stabilizes your blood sugar, lowers cholesterol and can even prevent certain types of cancer pertaining to the gut/colon. I love the F-Factor Diet because its not really a “diet” its basically how I live my life – eat clean, wholesome, REAL food – and its all about fueling your body with fiber filled foods – fruits, veggies, complex carbs – and lean proteins – fish, chicken, eggs & lean cuts of red meat – this high fiber + protein combo helps to lose and/or maintain a healthy weight + keep you satiated & energized as you move throughout your day! I believe there is still a [huge] misconception about eating carbs and weight gain. The key is eating the RIGHT carbs! When you nourish your body with the good-for-you carbs, the ones that give you energy & stabilize your blood sugar that I listed above – you can actually lose weight, (if needed) and feel full longer all while eating less – yes! Doesn’t that bowl of cereal above look delicious & so nutritious!? I love to combine 1/2 cup of Fiber One with several shakes of cinnamon ( a natural energizer & metabolism booster ) with whatever fresh fruits I have in the house, typically fresh berries & a banana, with raw nuts & seeds ( almond, walnuts, cashews, pepitas ) as you can see by the photos above! 🙂 Fill your bowl with a bit of unsweetened vanilla almond milk (my favorite brand is Califia because its carageenen free) and voilà! 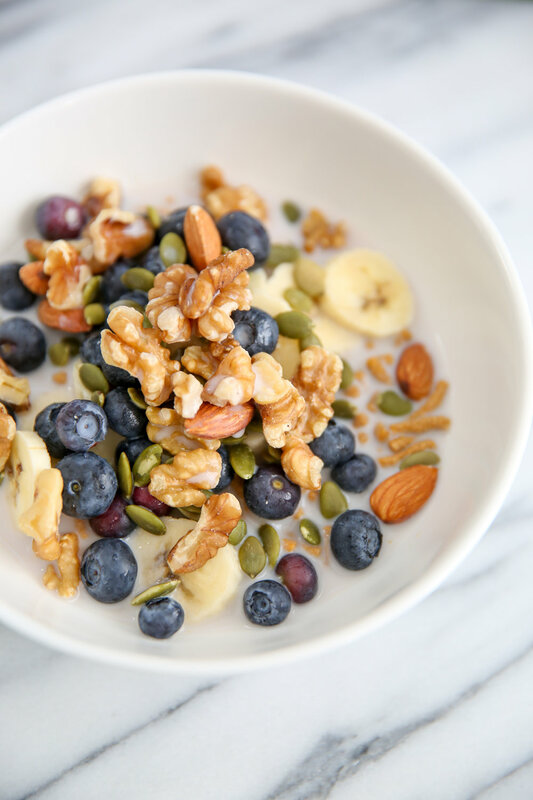 you have one seriously yummy, fiber filled breakfast to get your day started the happy, healthy way! Depending on how hungry I am, or just want some extra protein, I’ll scramble up one organic egg + some egg whites to eat, as well.